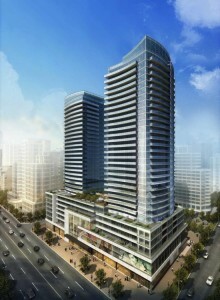 The Madison at Yonge and Eglinton (101 Eglinton Ave E), by Madison Homes, will consist of two towers (33 and a 30 storey towers) rising over an 8-storey podium. The first two floors facing Eglinton Avenue will feature over 53,000 sq ft of retail space. The Madison will feature extensive amenities. Its main amenity area will be located on the 4th floor, within the podium accessible from both towers. This level will provide 16,254 sq ft of indoor amenity space, plus an adjoining 6,204 sq ft of outdoor amenity space. Amenities on the 4th floor will be an indoor salt water lap pool, a hot tub off the pool deck and overlooking the outdoor amenity area, a co-ed sauna and steam room off the pool deck, a two-level gym overlooking Eglinton Ave, a Yoga room with a outdoor terrace, change rooms, a computer/meeting room, a movie theatre, a demonstration kitchen with adjoining seating area, a separate dining room with adjoining pantry and a double sided fire place between dining room and party room, and a common room/party room with various sitting areas with TVs, WiFi access, card table, pool table and a wet bar area. The wet bar area is double sided making it useable both from the party room and adjoining outdoor amenity area. The 4th floor outdoor amenity terrace features a variety of sitting areas around a centrally located fire pit, including five individual barbeque areas with cabanas. There will be another outdoor amenity area, this one meant to be quieter, on the 8th floor. This area will feature an additional 5,638 sq ft of space located between the two towers on top of the podium. It’s designed as a zen style outdoor garden retreat with a water feature at its centre. The podium suites are sold out, but there are still some tower suites available (1 beds, 1 bed + dens, 2 beds, and 2 bed + dens). Suites remaining range in size from 510 sq ft to 1045 sq ft. Suites are starting in the high $300,000’s. Parking is $29,000 extra. >>Click here to contact me if you are interested in this project, or any other Toronto condo or loft development (new or resale).